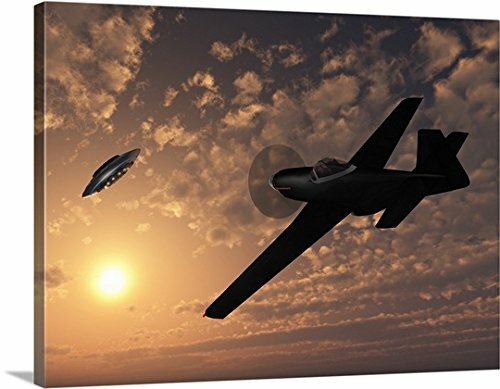 Gallery-Wrapped Canvas entitled 'An American P-51 Mustang gives chase to a UFO'. An unmarked American P-51 Mustang gives chase to a UFO over mainland America. Multiple sizes available. Primary colors within this image include: Light Yellow, Black, Gray. Made in USA. Satisfaction guaranteed. Inks used are latex-based and designed to last. Canvases have a UVB protection built in to protect against fading and moisture and are designed to last for over 100 years. Canvas is a 65% polyester, 35% cotton base, with two acrylic latex primer basecoats and a semi-gloss inkjet receptive topcoat.